How do we know “how it is being done” when we look at a product or even a code-base of a F/OSS project? In today’s high-speed, fast-paced software industry getting something out quick and earning lots points at the end of a sprint, is becoming a mainstream practise these days. If you want to make sure you are sticking to your Software Craftsmanship motto: “We do not want to ship s**t” like Uncle Bob very rightly says – then you have gotta find a better way to streamline your development process to achieve just that! That’s when tools like SonarQube ™ (formerly known as Sonar ™) come to our rescue or at least help us in the interim to get a better understanding of what software metrics and software quality can mean for your team! How to compare progress on a timeline and use it to get quick feedback to assess and improve the quality of the code we write and maintain is certainly an important thing to be able to do. Installing SonarQube on a Mac OS X system hasn’t been as smooth as on systems with a Linux/Unix environment hence this blog. With some tweaks, assistance from third-party sites and following the do-s and don’t-s you should be able to get long and successfully install SonarQube and SonarQube Runner! As installing and configuring SonarQube is an involved process, a number of items need to be taken into consideration and they have been categorised below under the various topics and sub-topics. Hopefully this makes the journey easier for all of us – since we have done it once and it has been a bit painful, its here for everyone else’s benefit. A suitable MySQL binary can be downloaded from  or directly from . Once the installation is complete, the create SonarQube database SQL script will require to be run via the MySQL console or through another SQL client that can connect to the currently running MySQL server. 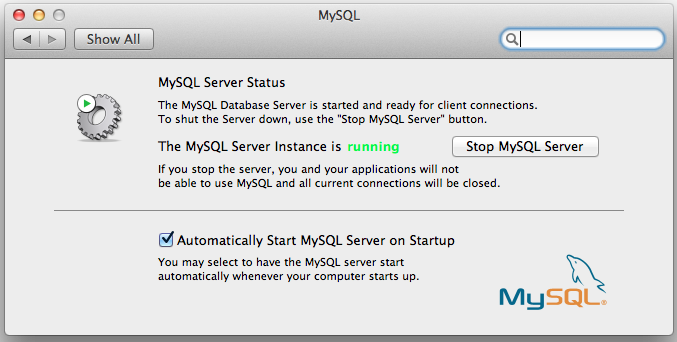 Hint: MySQL Workbench for the Mac can be downloaded from this MySQL dev site . Where MYSQL_HOME was set to /usr/local/mysql (check if it is the same in your case) in the respective bash configuration file. In order to not perform the above command on a regular basis, ensure that the Automatically Start MySQL Server on Startup is switched on. Download the latest binaries from the SonarSource downloads site . By default the web port where SonarQube is listening, is set to 9000, which can be changed in the $SONAR_HOME/conf/sonar.properties file. Change the sonar.web.port property to another setting if port 9000 is being used by another application, i.e. There’s one more place where this is defined and must be in sync with this file, see below in the settings.xml file – the line referring to …localhost:9000… which should be changed as well (to …localhost:9100… if the port settings in the $SONAR_HOME/conf/sonar.properties is also changed). In case you already have SonarQube installed from a previous attempt, then you would just need to upgrade to the new version. But before upgrading to a newer version, please ensure the existing database is backed up, just in case the upgrade process does not restore the existing data (use the Backup facility available under the Settings menu option or go to it directly via http://localhost:9000/backup). …this should take few minutes and the databases should be migrated to the latest version. A few other parameters are available i.e. console, status and dump – SonarQube needs to be running in order for any of these to work, which you will find out very easily with the “sonar is not running.” message. Note: MySql must be running when SonarQube is (re)started. In the above case it is assumed that SonarQube is installed in the /opt/ folder. SonarQube can be setup to analyse projects through various ways, one of the other ways is to use SonarQube Runner, which requires a sonar-projects.properties file that would contain the basic definitions of the nature of the project. It is used in case the project to analyse is not maven project (does not have a pom.xml file).SonarQube Runner can be downloaded from the same location where the SonarQube binaries are kept . Unzip the archive containing the binary for SonarQube Runner into a folder i.e. /opt/ folder and set the environment variable SONAR_RUNNER to this location in the respective bash configuration files. Now open the $SONAR_RUNNER/conf/sonar-runner.properties file to enable the configuration to refer to the running SonarQube instance. Uncomment all the lines except the ones containing the settings to Postgres, Oracle and Microsoft servers. We will cover the two ways SonarQube can be used to analyse a project (written in one of the SonarQube supported programming languages ) by either via maven or through sonar-runner (for non-maven projects). Here are a couple of links to sample sonar-project.properties files to assisting in creating new ones i.e. 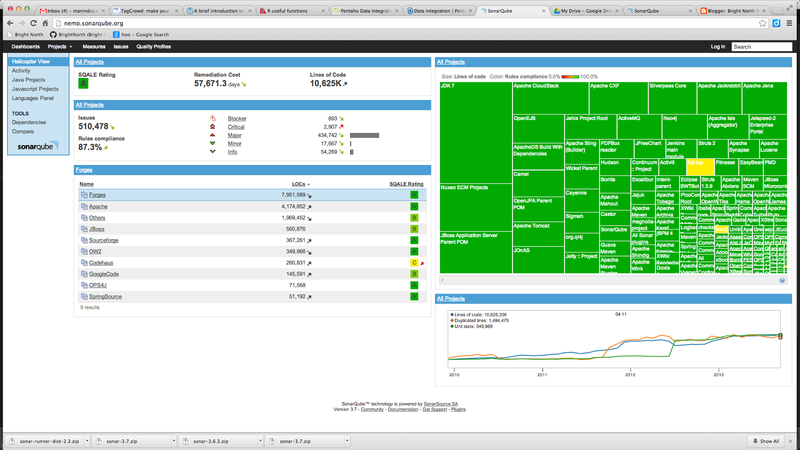 Sonar setup for non-maven Java project  and Analyzing with SonarQube Runner . The log files created in the $SONAR_HOME/logs folder is a good place to look when faced with build failures or when the web GUI throws unexplainable errors. Also examine this file during the migration process from an older version to a newer one. In particular $SONAR_HOME/logs/sonar.log contains SonarQube specific system level log messages. All the CLI commands can be set as aliases in the respective bash configuration files as shown here . Always source the bash configuration files after amending them. During the installation of SonarQube, a number of links came to rescue by helping tackle some technical challenges and have been mentioned throughout the blog including some below. In theory these instructions should work on other versions of Mac OS X as well, but they have only been tested on the above environment (see section Environment). These instructions are in principle similar to the steps for Ubuntu or other Unix/Linux based OSes – with some tweaks it should be possible to install and run SonarQube in such environments as well. The terms Sonar and SonarQube have been used interchangeably in a number of places above. Some of it is due to the referred links not being updated, and others are due to the fact that scripts and program references have continued to be used with their original names to prevent issues with dependencies. Do not take the settings, paths and file locations, url references, excetra mentioned in this blog literally, in some cases they would need to be adjusted to settings relevant to your environment. Please note all the external links on this blog may or may not stay actual and is not feasible to maintain them as part of this blog post. Please feel free to contribute to the above post in the form of constructive comments, useful links, additional information, excetra to improve the quality of the information provided. If something hasn’t worked for you and you have managed to make it work or have a work-around / alternative solution, please do share it with us!